You may have heard about my love of stickers? Well, last a fall a blog I love posted about a sticker subscription service, and I loved the idea and bookmarked it and then promptly forgot about it. Then about a month ago, I met a mom for coffee who is actually friends with the creator of this company, and I was reminded. So today, I headed over to Pipsticks and ordered a subscription using a coupon code from their Facebook page. 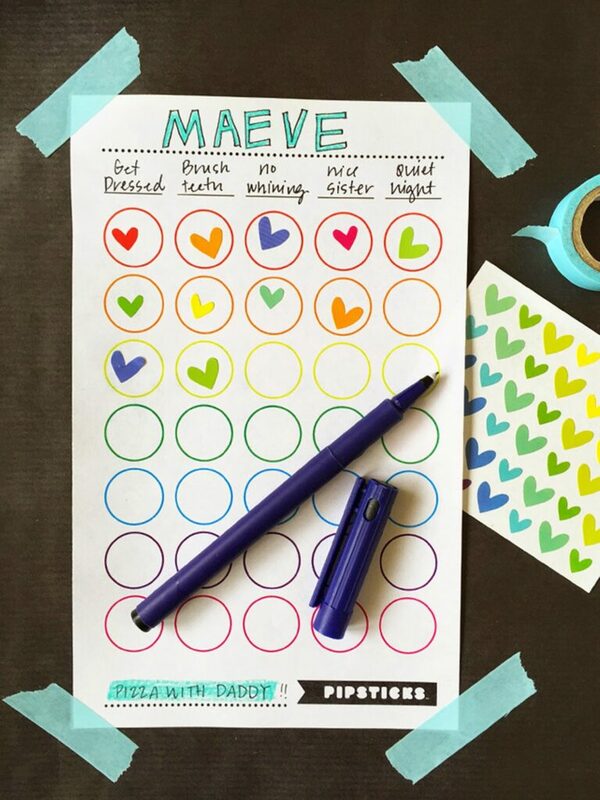 While I was there, I started looking around at the fun printables and ideas they had on their site and I LOVE this idea. Sticker reward charts are a big deal in this house right now. So…anyway, more talk of stickers. If you have kids (or happen to be like me – a seven year old at heart), you should look into it. I’m surprised at how reasonable the prices are for 15 sheets of cute, cute stickers. In other news: Go Badgers. It was sad watching them lose yesterday, but I had a great time watching them play and was so impressed with them as a team. I remember going to games at The Field House as a student (I’m old) and can’t imagine how thrilling it would be to actually be there to see “Frank the Tank” play in person (I have to admit, I have a bit of a crush). On the needles: A shawl and a pair of socks. Reading: Defending Jacob, The Orphan Train, Counting by 7s, and Angus, Thongs, and Full-Frontal Snogging (Confessions of Georgia Nicolson, #1). I gave up on Tinker, Tailor, Soldier, Spy a little over half-way through. Maybe I’ll come back to it – I just felt the whole thing was kind of discombobulated and over my head. Watching: Scandal and Nashville. Mad Men is starting up again and I’m impatiently waiting for HBO Now to come online so I can be ready for Game of Thrones. I’ve also been heading to this Cross-Fit gym a couple of times a week for the last couple weeks. I’m absolutely loving it (which is quite a surprise) because it feels so much like playing did as a kid (though I don’t remember ever being sore after a day on the playground). I also LOVE that there aren’t mirrors everywhere. The last thing I want to see when I’m working hard is my fat sweaty tomato face. The trainer I have is also extremely helpful and encouraging. I made one of my really good friends promise to bop me upside the head of I started talking workouts and Crossfit all the time so hopefully I won’t get too annoying (and if I do, I welcome you virtually bopping me upside the head as well) Also, I can promise you…never, ever, ever will there be any discussion of me going paleo. So that’s me. Happy Tuesday! Are you looking forward to anything this week? I LOVED Counting by 7s. I didn't think I was going to–the protagonist seemed a little too precocious/precious–but I fell in love with her. Now I push that book on everyone. 🙂 And because I've been sick for nearly 3 weeks, I had a great excuse to not go to the gym, but that's coming to an end. Sigh. I'd really rather read than sweat. Sweating is probably my least favorite activity but I'm trying to learn to like it. Something about this upcoming birthday has me feeling a bit skittish and thinking it's time to take care of the machine.